Yes, we can! 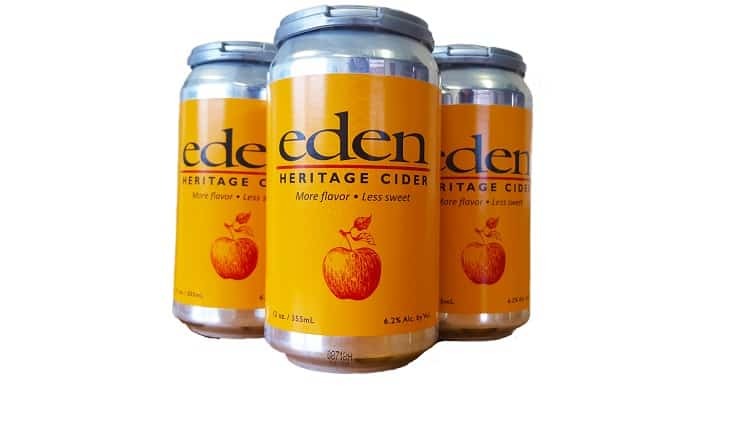 Looks like cider in cans is a trend that’s firmly here to stay, further evidenced by the news that Eden Specialty Ciders, a Vermont-based cider known for gorgeous ice, aperitif and sparkling dry ciders, has introduced its new Heritage Cider in a can. “Our Heritage Cider cans give consumers an option to find more fresh-fruit character, without added sugar, in a convenient package at a moderate price,” says Eleanor Léger, founder of Eden Specialty Ciders. Exclusively available in four-packs, these beauties are made with a blend of five heirloom and table apples: Gravenstein, McIntosh and Empire apples for complexity and juiciness, and Kingston Black and Bulmer’s Norman, both English heritage varieties, for body and texture. Immediately following autumn harvest from the four small Vermont orchards on which the fruit is grown, the apples are gently pressed before the juice begins a slow, cool fermentation. Post-fermentation, the cider maker adds just a touch of Eden-produced ice cider and then allows the blend to rest in stainless steel tanks for five months before canning. Crack open a can to find a 6.2% cider with no added sugar or flavorings and a whisper of minerality balanced with hints of tropical fruit and candied raspberries on the finish. Heritage Cider cans are available in most of the 17 markets where Eden Specialty Ciders are distributed: Vermont, Massachusetts, Maine, New Jersey, New York, Colorado, North Carolina and South Carolina, and coming soon to New Hampshire, Virginia, Maryland, DC and Illinois. If you get your hands on a four-pack, let us know what you think!